Anh Does Vietnam DVD Review Anh is certainly no shrinking violet, and whether he’s leading an impromptu outdoor aerobics class or fishing with village children in a muddy stream, he’s clearly at his happiest being around people and doing his best to make them laugh. 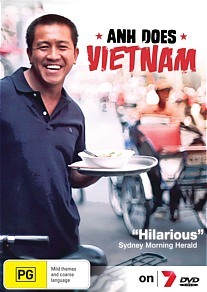 Midway into his movie length, two-part TV special Anh Does Vietnam, irrepressible Aussie comic Anh Do matter of factly relates his family’s escape from post-war Vietnam. As recounted in his best-selling memoir The Happiest Refugee, the infant Anh and some 40 other asylum seekers survived a harrowing five day Indian ocean crossing, running out of food and water several days into the trip and braving repeated attacks from pirates before finally making it to the comparative safety of Australian shores. Though a hugely successful actor and comedian in his adopted homeland, Do says he continually found himself musing what his life would have been like had he never left Vietnam. This forms the premise of this engaging and affectionate travelogue, which sees him journeying from Saigon to the country’s northernmost borders, taking in the sights and turning his hand briefly, and usually not entirely successfully, to a number of potential career paths such as cyclo driver, organic farmer and bicycle delivery man. Anh is certainly no shrinking violet, and whether he’s leading an impromptu outdoor aerobics class or fishing with village children in a muddy stream, he’s clearly at his happiest being around people and doing his best to make them laugh. Both his ever-present smile and his joy for life are infectious, and though the series breezes by at 86 minutes he proves a dab hand as tour guide throughout, providing a multifaceted and at times moving overview of this beautiful, tragedy-ridden and ultimately inspiring country.